Researchers, namely Seow Ai Na, Dr Choong Yuen Onn, and Chan Ling Meng, from the Faculty of Business and Finance (FBF) were awarded the “Best Nominee Paper” Award at the International Symposium & Exhibition on Business and Accounting 2018 (ISEBA 2018). The symposium was organised by the College of Business Management and Accounting (COBA) of Universiti Tenaga Nasional (UNITEN) from 28 to 29 August 2018. ISEBA 2018 aimed to promote and develop high-quality research of all issues related to business and accounting. ISEBA 2018 also acts as an international forum for academics, researchers, and practitioners to interact, collaborate and share knowledge and experience. 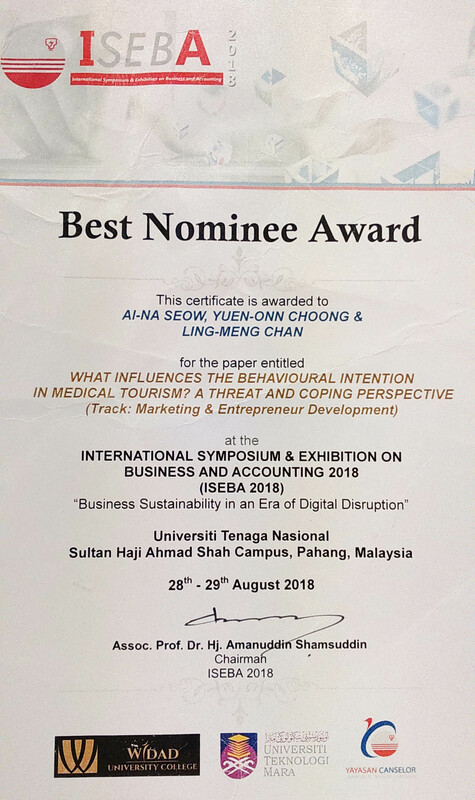 “We are very honoured to be given this recognition and we are thankful to UTAR for the constant encouragement to conduct researches on the latest trends. Having this award definitely motivates us further to publish more papers that are related to the latest trend in the tourism industry. 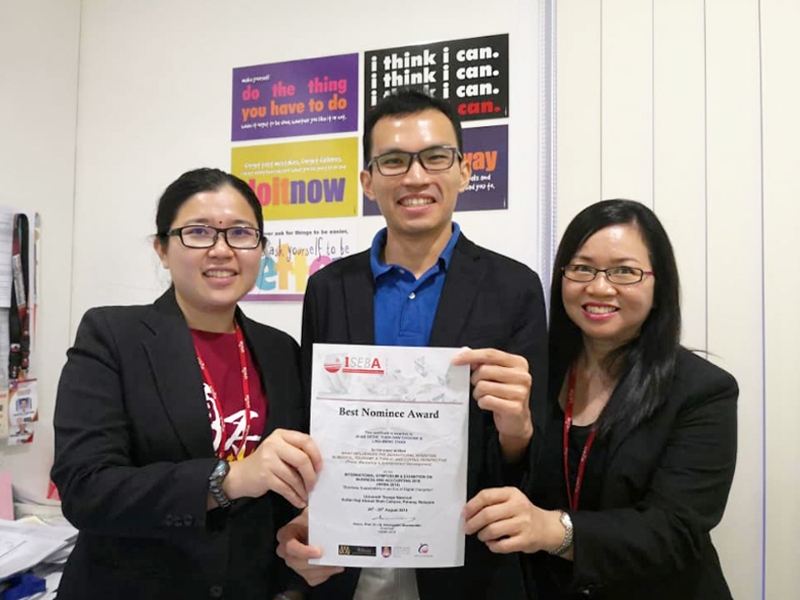 With this award, we are also able to show the world that UTAR researches are constantly kept abreast with the latest topics and developments,” said Seow. Seow, was also awarded the “Most Downloaded Paper” award by Wiley International Journal of Tourism Research (IJTR). Titled “What influences the Behavioural Intention in Medical Tourism? A Threat and Coping Perspective”, the award-winning research obtained the second highest point (percentage) in ISEBA track, which is based on Best Paper Awards criteria’s and recommendation by BPA external reviewer. The research explained that decision making in medical tourism is relied heavily on the notion in rational choice assumptions to underpin behaviour. With the limited literature focus on social psychological theory in medical tourism perspective, protection motivation theory (PMT) has been chosen to provide insight knowledge to explain in details. This study aims to evaluate the threat appraisals with regards to perceived threat on health, and the coping appraisals in relation to perceived efficacy and response cost from international tourists on their behavioural intention in receiving medical services abroad. A total of 265 responses were analysed via partial least square-structural equation modelling to assess the measurement model and structural model. From the findings, it is evident and accentuated that perceived severity, perceived vulnerability, perceived respond efficacy and perceived self-efficacy are significantly predicting international tourists’ behavioural intention in medical tourism. Several implications emphasising on the adoption of PMT on tourists’ behavioural intention are identified. The research further confirmed that theoretical approaches are useful in bridging the gap in behavioural study. In particular, it will help stakeholders, medical facilitators and policy makers in Southeast Asia to enhance the marketing effort and intensify growth in the medical tourism industry. “The research aimed to examine perceived threats and coping components on the behavioural intention among international tourists for having medical tourism in Malaysia. The research ascertained that both perceived threats and perceived efficacy play an important role in influencing international tourists’ intention to seek medical tourism in Malaysia. It provides insights that the Ministry of Health, healthcare centre or association should ensure the quality and advancement of facilities, infrastructures, healthcare centre environment as well as technologies are up to the international level to enhance the international tourists’ efficacy and confidence in receiving Malaysia’s healthcare services,” explained Chan.